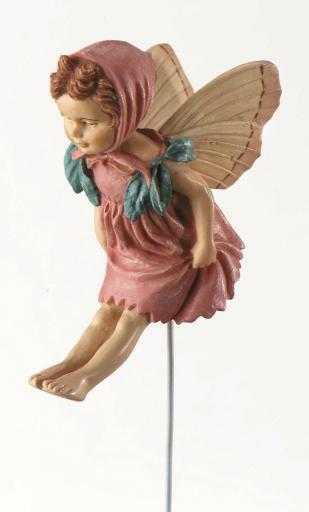 Beautifully hand painted Red Clover Flower Fairy figurine. Optional gold string and wire pick included for securing in your display. Individually packaged in its own window display box that includes a biography of the artist, Cicely Mary Barker. The fragrant Red Clover fairy greets bees with a curtsey and obligingly invites them to sample red clover nectar. When her insect visitors have filled their honeybags, she politely bows and urges them to visit again soon. Her cheery charm ensures a steady supply of honey for the Flower Fairies. Beautifully hand painted Red Clover�Flower Fairy figurine. Optional gold string and wire pick included for securing in your display. Individually packaged in its own window display box that includes a biography of the artist, Cicely Mary Barker.